Keys spent his entire professional career working with Reclamation throughout the Western United States. From 1964 to 1979 he worked as a civil and hydraulic engineer, manager, and executive in the Great Basin, the Missouri River Basin, the Colorado River Basin, and the Columbia River Basin. In 1995, Keys received Interior's highest honor-The Distinguished Service Award. 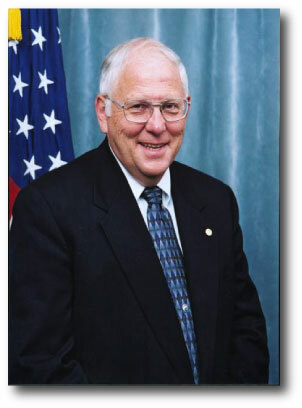 In 1998, he retired from federal service, having served as Pacific Northwest Regional Director for 12 years. In 2001 Keys returned to Reclamation as its Commissioner. While Commissioner he devoted a great deal of energy to opening communications with water users and was very proud to be Commissioner during Reclamation's centennial year in 2002. He retired from that position in 2006. A commercial airplane pilot, Keys flew a Cessna 182, and in retirement he flew many hours a year for Angel Flight, Air LifeLine, and County Search and Rescue, based out of Moab, Utah. In addition, he was a college football referee between 1970 and 2001 as well as a high school referee beginning in 1962. His wife is a family practice physician and Airman Medical Examiner, and she flies a Cessna 172. Keys was a native of Sheffield, Alabama. He received a Bachelor's Degree in Civil Engineering from the Georgia Institute of Technology in 1964 and a Master's Degree in 1971 from Brigham Young University. Keys was a registered professional engineer in the states of Colorado, Wyoming, Montana, and North Dakota. Born on March 25, 1942, he died when the plane he was piloting crashed in Canyonlands National Park on May 30, 2008.